There are monsters in the trees. As Ellison packed his things today for his big move to England, another big monster was born. Meet Alistair. He is even bigger and even fatter than Ellison [but equally as sweet and cuddly.] 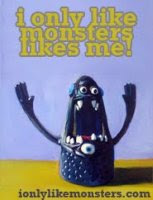 So many of my monsters seem to be moving to the UK lately. I'm not going to lie, I'm a bit jealous of their travels! Since it was a BEAUTIFUL spring day, I let the two new friends play outside. They decided to climb trees and I snapped a few photos before my camera batteries died. Knitting these big guys has been really fun... I may knit one more before I switch gears again... but probably not as big as Alistair. He used up A LOT of yarn.